Join the discussion on our forums! 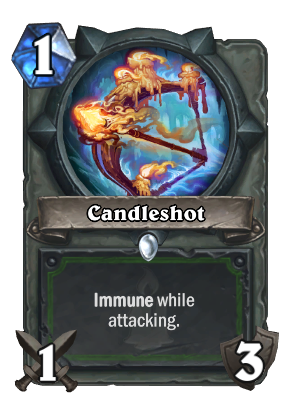 Come discuss Candleshot over in our dedicated Candleshot discussion topic. Once called Cahn’delar, Shortbow of the Ancient Whisker. this card is pretty intersting. It is very useful at removing low level minions early game. However, even after that it keeps its use. Since the text reads "immune while attacking" , attacking the hero will trigger secrets. However, explosive trap (since you are attacking) will not damage your hero if triggered. you also will not take any damage from any "when hero attacked" minions. You also can safely let off Misdirection, wandering monster and defender secreets without taking damage. Very useful. Fantastic card. Amazing for early game board control when combined with your minions on the board or your spells for efficient trades. Always happy to see this in my mulligan. Yeah, excellent answer to Rogue's turn-1 deckhand. i just realised it's the hero that's immune, not the woepon; i'm an idiot. It's no Glaivezooka but maybe it could work. Agreed. Really low impact, mostly only good in baku restriction for control activators namely Hunter's Mark and anti aggro, but it does show you how Gladiator's Longbow works! This is a very good card i believe. A problem hunter has is that it does not have easy access to a 'ping' unless they have just traded into your deathrattle minions. You dont want to have to use Unleash the Hounds just to summon 1 doge and hit a hydra once. This card fills a bit of a gap in the playstyle of hunter but i fear hunter will still be stuck in the same old midrange archetype till the end of time so this may only see 1-of experimentation for now. Worthy note if you are running the spell hunter deck, this combos with Hunter's Mark very well. Would also be a staple in a (prepare for it) control hunter deck. 1 Doge, I chuckled. :) The new 2/1 echo rush in Witchwood looks promising as a replacement for Unleash too haha. Agree with the Hunter's Mark synergy for quick removal! Agreed, it's great anti aggro! And the invulnerability keeps it relevant throughout the game, plus synergises with Hunter's Mark just like the famous Pyrom./Equality does. The french wording on playhearthstone translates to "You hero is immune when he attacks". The weapon should lose durability. Same goes with the german version. a ranged weapon that prevents your enemy from hitting you? Who came up with that brilliant idea? Is it really so hard to Ctrl+C, Ctrl+V the text from Gladiator's Longbow into this card in order to avoid mass player confusion? According to blizzard "Big sentences confuse the average player". I mean, getting rid of unnecessary text it's a good thing. YuGiOh's been doing this for years. These are the same people who let Druid of the Claw's fucked text exist. At this point, we shouldn't be surprised anymore. @RatedDart Agree, but this is definitely necessary as the current text is ambiguous: infuriate the playerbase with your inconsistency and patronization.